Battery powered light’s 12 super-bright LED bulbs and vertically pivoting head brighten any task. 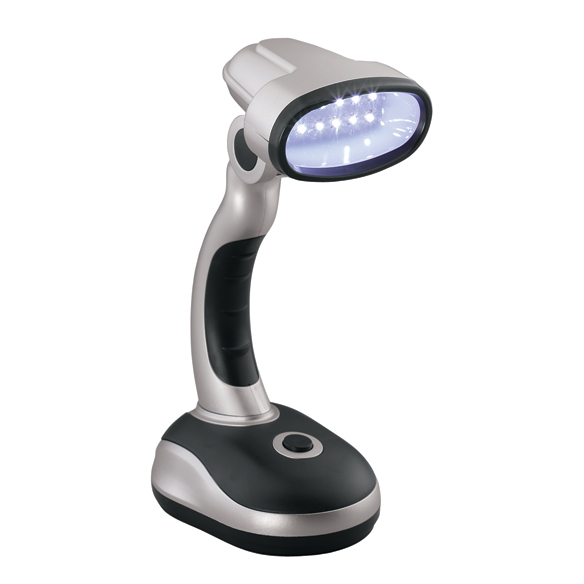 Portable LED light is powered by included USB computer cord or 3 AA batteries (not included). 6 1/2" x 4 1/4" x 3". I have a small desk space, and this light fits perfectly. It can also be used as a flash light if you are using batteries. I like the feature when I shut my laptop off, the desk light automatically turns off also. lightweight, mobile, bright, ez to use. wish it also had an outlet plug as well as USB. They laughed at me when I bought this! To save on electricty cost. Brillant light. My home manicurist loves it, now she can see every detail. I read with it. I love it. I order this for my job it is very helpful. I wish they had a larger lamp just like this. I have received a lot of complements on my light at work. I love it! Very bright. I use it for reading and near sewing machine and in the bathroom. Some of them come with a USB cable now. Not this one. I have seen a pretty red and a blue one also. Buy it you won't regret it. These are quite small but they do give quite a bit of light. You can use them for just about anything. They seem to be made very well. I have already used mine at the computer but plan on using them for puzzles. Glad I have them. They are great when you have a power outage. I use this little light beside my computer when I only need a little illumination. Good size and very handy. These are just what I needed when task lighting is needed. Love the adjustable head and the bright light. Very Pleased. This is one of those(handy) items, that is nice to have & use instead of candles when the power goes out. This little light is just the right size, and can always be ready when the power goes out. It shines really bright! Our couch is in the middle of the room with no electric outlets close. Since it is hazardous to run a cord across the floor this light sits on the arm of the couch and works great for reading, etc. Best flashlight I have. I have 3 of them. We use them all over the house. We also take them camping. Perfect for late night readers! My Husband turns off most lights at night while watching TV, and sometimes I want to read something, especially during commercials. This light does the trick. Love these lights, they r space savers and puts outs good light. The best when there is no electricity, on a road trip etc. I bought this to use on my computer desk. Its small size is perfect and it sheds the right amount of light. I also appreciate that I can plug it into my computer's USB. This light has no drawers, get it together guys if you want a response. Bought this for my husband to use in his shop for close up work such as soldering. Also great for power outages. I use my light for my computer. It sits right beside my monitor. I can turn it on and it will shine on my keyboard while I am typing. It would also be great if the lights went out, because it is light weight and you can carry it around with you. Also, if you are looking at small print it is great for that the light is so bright and it runs by batteries. Be a great gift. I use this product to read books at the kitchen table. I rarely sleep during the whole night so when I am awake instead of using the large overhead light I use this. It is wonderful. It is very bright, and easy to read from. I would recommend this product. I used this during hurricane Isaac in New Orleans. It had been sitting for months with on and off use. The electricity went out, and I used this. It lasted at least 8 hours on the same batteries that were already in it. It wasn't bright enough for lighting the entire room, but it was bright just the same. I ordered three more! I got this for my wife as a Christmas gift. We had been looking for some time to try and find something like the light. She absolutely loves it. It is attractive, easy to operate and very lightweight. The light is great for reading. It comes in handy for several things. I have even used it as a flashlight. It is bright and helped me read some small numbers on the back of the tv. Main use for me is a reading light at bedtime. I don't have to get up to turn off the ceiling light when I start getting drowsy. A nice extra is that it comes with a computer plug in, so if you don't have batteries you can get power from the USB plug. I sometimes have my tablet in bed with me at night and plug the light into the side of it. Works great and no batteries needed!! Great price. This is a neat little light. It really helps me when I am reading or paying bills. I have ordered another. Too bad when I ordered the second one the cost was about a third more than the first. Very handy in a room with only high ceiling lights. I can put this little lamp right near whatever I am working on. It is a great task light. Bought this light to use at my computer desk for extra light. It is smaller than I expected and only has one light setting. It is convenient because there are no cords, easy to move around and it quite bright. Glad I ordered this lamp for many purposes. Handy light, I have given several as gifts. Love it! Use this handy light almost every day. Only down side is remembering batteries. I have given several lights as gifts. Love it! I use these two lamps to assist with lighting in my living room. They are bright enough to read by but I use them for doing word search puzzles. I can carry them through the house in the evening when it is dark to see by. I am cutting back on using electricity. These work well for that. Great little product! I love this little handheld LED light. I take it outside with me on the patio in the evening to read and the bugs are not attracted to it.. But I certainly am! This item is what I was looking for. I like to have TV on while working on computer but need room lights on to see key board. With this the room can be dark for the TV yet I have direct light on my work. It will also be handy in the car. I am getting more. I could have got two for the same price from a different vender, but then what would I do with two when I only need one! 1 flickers all the time. I bought 2 of these due to bad lighting in my home office. I tried one of them, but it started flickering and defeated the purpose of the purchase. I just opened the second lamp, inserted batteries--and it flickers, too! I ordered three lights, but one did not light up completely either with new batteries or the USB connector. Two were good compact and bright. LED burnouts occur during USB plug ins. Two had most LEDs burn out on use of the USB plug making the light useless. The last I just use with batteries for I am afraid it will also burn out. Where is my item? I ordered it weeks ago, but never got an order # message or anything. This light is very weak and could possibly make a good night light but not sure if the batteries would last all night. So 'plastic' - really is a 'dollar store' purchase only, cost of this item + shipping is not worth this product. The 'catch' that keeps the lid over the batteries broke with the 2nd use (did not store batteries in it, when putting in the 2nd time was when that broke). Hoping it will help at my desk. Have some of these. They are Sooo very bright and very handy. To see in dark places. I like these lights because I can set them down to use them. They are small and convenient to leave them in multiple areas around the house. Similar to lamp I already have. Very convenient. Hoping this will be as good! this will help me in my bedroom at night. Participating in a craft show and needed battery powered lights. I purchased one before and I love it. Love this light when putting on makeup. HELPFUL FOR POWERE OUTAGE EMERGENCIES. Our electricity goes off periodically, and I needed a light when that happens. Good to illuminate small spaces. Bought for gifts. Good little light. I have 3 now, these are for friends. Getting older - need something bright I can move around to wherever I'm reading. I will use this instead of an electric light when I'm on my computer at night. I like the idea of a strong light that can easily be moved from one location to another. Provides a quick and easy light for power outages. Sits up and shines light sideways, which is better position than a flashlight. It's handy to have on my desk. To keep it close to my computer when I type at night. when power goes out i have a lamp.